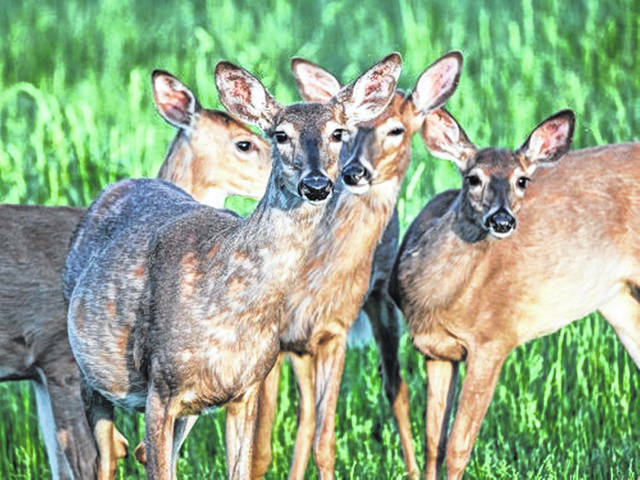 Ohio’s current status designation for deer is “chronic wasting disease-free in the wild.” There have been reported cases in three surrounding states: Michigan, West Virginia and Pennsylvania, according to the CDC. The disease has been detected in 24 states. Question: I keep hearing about “zombie deer.” What is that? Answer: What you are talking about is chronic wasting disease, a disease that has been featured in numerous national media outlets and news stories in recent weeks. Chronic wasting disease, which has also been called “zombie deer disease,” rots the brains of deer, elk, and moose, causing them to act lethargic and less afraid of humans before dying, according to the Centers for Disease Control and Prevention. While Ohio’s current status designation is “chronic wasting disease-free in the wild,” there have been some reported cases in three surrounding states: Michigan, West Virginia, and Pennsylvania, the CDC said. The disease has been detected in 24 states thus far, the CDC said. “Chronic wasting disease is a highly relevant topic and people are seeking sound science and guidance on this issue, including its impact on deer meat or venison,” said Gabriel Karns, a visiting assistant professor of wildlife ecology and management in the School of Environment and Natural Resources at The Ohio State University College of Food, Agricultural, and Environmental Sciences. Nevertheless, the CDC does advise people to take certain precautions when dealing with deer or elk and the meat from those animals in areas where chronic wasting disease is confirmed within the wild herd. The CDC recommendations include the following. Do not shoot, handle, or eat meat from deer and elk that look sick or are acting strangely or are found dead (roadkill). – wear latex or rubber gloves. – minimize how much you handle the organs of the animal, particularly the brain or spinal cord tissues. – do not use household knives or other kitchen utensils. – check state wildlife and public health guidance to see whether testing of animals is recommended or required. Recommendations vary by state, but information about testing is available from many state wildlife agencies. – strongly consider having it tested for chronic wasting disease before eating the meat. If your animal tests positive for chronic wasting disease, do not eat its meat. “For Ohioans, one should not hesitate to eat venison from wild white-tailed deer,” Karns said. The results of a test can then inform the hunter’s decision of whether or not to consume the venison, Karns said. “While more cautious culinary approaches, such as not cooking deer bone-in roasts from the neck region with spinal cord intact, may eventually become a standard precaution, the fact remains that current evidence does not suggest that chronic wasting disease affects human health,” he said.